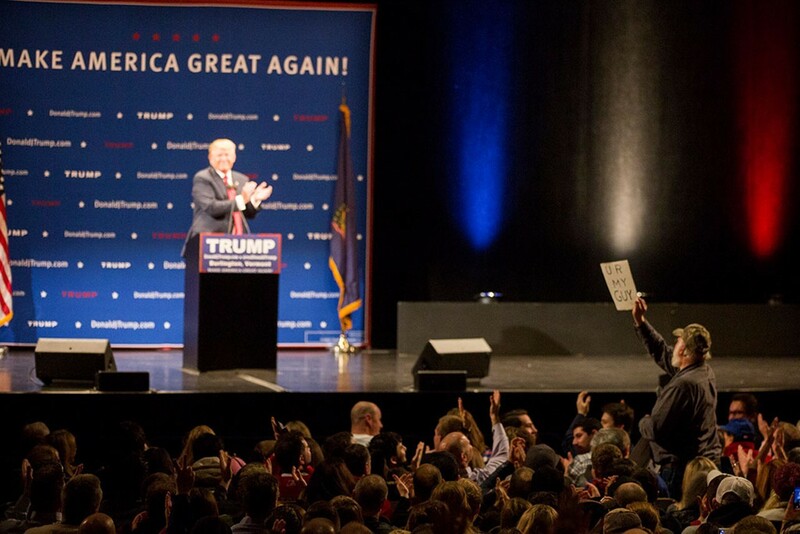 Trumped Up: Who Were Donald Trump's 19,974 Vermont Voters? Last Tuesday, 19,974 Vermonters voted for a bigoted demagogue whose presidential campaign has been fueled by venomous rhetoric targeting women, Hispanics, Muslims, veterans and the disabled. But even though Donald Trump — the orange-hued reality-television star and steak salesman — won Vermont's Republican primary, his voters are an elusive breed. "I gotta be honest: I can't name a single Trump supporter," says former governor Jim Douglas, whose name graced the Republican ballot for more than 35 years. "I've had conversations with people who are supportive of Trump in Vermont," says David Sunderland, who chairs the state GOP. "But I couldn't put a name to them right now." Sure, Trump won more votes than Ohio Gov. John Kasich (18,534), with whom he evenly split Vermont's 16 Republican delegates, and he even outpolled former secretary of state Hillary Clinton (18,338). But Trump's voters amounted to just 4.5 percent of Vermont's registered voting population of 442,432. And while he took 32.3 percent of the Republican vote, he won just 10 percent of the total cast in the state. That's because an overwhelming 115,900 Vermonters chose home-state Sen. Bernie Sanders (I-Vt.) instead. Trump won more than 20 percent in just 16 tiny towns — most in the rural reaches of the state. He earned more votes than Sanders in a single municipality: the Bennington County town of Searsburg, whose 44 voters cast 15 ballots for the Trump University founder and 14 for the senator from Vermont. In the Northeast Kingdom, Victory's 51 voters were divided equally between the two, giving 16 votes to each. In Trump's 10 worst towns and cities — including Burlington, Middlebury, Montpelier and Norwich — he took less than 5 percent of the vote. Looking at the results through a historical lens, Trump earned support from significantly fewer Vermonters than the winners of the state's last three contested presidential primaries: Mitt Romney in 2012 (24,008), John McCain in 2008 (28,417) and McCain in 2000 (49,045). Even George W. Bush, the second-place finisher in 2000, won more votes than Trump did this year: 28,741. Charlie Papillo, who has cohosted a conservative talk-radio show on Colchester's WVMT-AM for 19 years, says he's "never been a huge fan of Donald Trump," but plenty of his listeners are. "He's resonating with this anger that people are feeling," he says. "They're angry with the establishment." They're even angry at Papillo, though he's hardly a pinko. "I remember when I started going on rants about Donald Trump," he says. "Man, that just opened up the spigot to people calling in, saying, 'You're a RINO — a Republican in name only.' We still get it to this day." Indeed, exit polling conducted by Edison Research showed that Trump's Vermont voters are twice as likely as Kasich supporters to say they're "angry" at the federal government. While Kasich supporters said they're more concerned about the economy and want a candidate who shares their values, Trump voters said they're worried about terrorism and want a candidate who "tells it like it is." Though Trump's conservative credentials have been questioned, the exit polls showed that those who consider themselves Republican are more likely to vote for Trump, while Vermonters who call themselves independent favor Kasich. That might explain a strange phenomenon in last week's results: Though almost exactly the same number of Vermonters voted in the 2016 presidential primary as in the heavily contested 2008 primary — about 197,000 each year — 20,000 more took a Republican ballot this time around, and 20,000 fewer chose a Democratic one. That's despite the fact that a Vermonter was running as a D.
Could it be that many independents and Democrats took a Republican ballot to strategically oppose Trump? Or perhaps it was the reverse: that Trump inspired those outside the Republican fold to support him. Or maybe some decided there was no point voting in the Democratic race because Sanders was sure to win. Sunderland, the Republican party chair, sees it as a good sign for the GOP. "I think that should be alarming for the Democrat[ic] Party that there's not more enthusiasm, even with Bernie on the ballot," he says. Maybe so, but Trump's presence on a general election ballot could be disastrous for Vermont Republicans — particularly those seeking the governor's office — because it could depress Republican turnout or motivate Democrats to go to the polls. "My answer to that is '04 and '08," he says, referring to years he won reelection in the face of fierce presidential headwinds. "Vermonters aren't fooled by the inevitable Democratic rhetoric of, 'Phil Scott is joined at the hip of X,' whoever the nominee is. They're smarter than that." Scott, the Republican lieutenant governor and front-runner for his party's gubernatorial nomination, has been clear for months that he opposes Trump. He endorsed Sen. Marco Rubio (R-Fla.) days before the primary and says he wouldn't even vote for Trump in the general. "I think he actually would be dangerous to our country," Scott says. "I can't vote for someone who acts the way he does — disparaging women, minorities, mocking people with disabilities." The lieutenant governor says he was particularly disturbed by Trump's imitation of a New York Times reporter with a congenital joint condition, because Scott's own father was a double amputee. "I have family members who are suffering from different disabilities," Scott says. "They're 100 times the human being [Trump] is." Scott's Republican opponent, Bruce Lisman, says he does not "approve of some of the things [Trump is] talking about." But the retired Wall Street banker, who endorsed Kasich two days before the primary, won't say whether he would support Trump in November. "If or when Mr. Trump is nominated, I'll worry about it then," he says. "I don't know how much of this is real and how much of it is rhetoric." Unlike Douglas and Sunderland, Scott says he knows plenty of Trumpeters. "Yes, I do. I have friends and acquaintances who are Trump supporters who surprised me," he says. "I've even received some messages, emails, phone calls saying, 'I can't support you if you're not going to support Donald Trump.'" But, Scott adds, "Sometimes you have to put your principles before politics." Norwich attorney Jack Candon received an unusual phone call this week. It was Vermont gubernatorial candidate Matt Dunne's campaign manager, Nick Charyk, informing him that his $250 donation was being returned. Last month, Candon had cut a check to the campaign from his law firm's account. That's perfectly legal in Vermont, but Dunne had decided that he would no longer accept corporate contributions — from large multinationals or even locally owned law firms. "I think it shows a good deal of integrity in the campaign," Candon says. "I'm happy to receive the check back, cancel it and send one from my personal checkbook." Ahead of next week's campaign finance filing deadline, Dunne is returning $16,050 from a dozen corporate entities — including $4,000 each from Hotel Vermont owner Westport Hospitality, New Hampshire-based Wagner Rehab and New York-based McAlinden Associates. "I've come to the conclusion that taking contributions from corporations is a contradiction of what I've always said, which is that we, as a state, should ban corporate contributions," Dunne says. "Vermont has come out strongly against Citizens United, and I believe it's important that we walk the walk." That's quite an evolution from last October, when the Hartland Democrat defended his acceptance of corporate contributions, saying, "I don't believe in fighting with one arm tied behind my back." Dunne's self-imposed policy closes a loophole — at least for him — that Vermont politicians have exploited for years: taking money from a donor's company after he or she has contributed the maximum per-individual amount allowed by law. Last July, for example, Hotel Vermont cofounder Jay Canning and wife Caroline Canning gave Dunne the legal limit of $4,000 each — and then another $4,000 through Westport Hospitality. Despite the shift, Dunne still isn't pure as the driven snow. He'll continue to accept money from registered lobbyists, unions and political action committees. But the move has earned him praise from one potential gubernatorial opponent: campaign finance crusader and former Democratic state senator Peter Galbraith. "I think this is a very positive step," Galbraith says, adding with characteristic modesty, "Perhaps it shows the influence even my consideration [of running for governor] is having on the race." Dunne and Galbraith say they hope former transportation secretary Sue Minter, the other Democrat in the race, will follow Dunne's lead. Reached Tuesday afternoon, Minter campaign manager Molly Ritner said it was the first she'd heard of such a request. "Generally if candidates are calling on other campaigns to join them in a pledge, they contact those campaigns," Ritner says. "When a campaign contacts the press before the other candidates, it's a campaign stunt." Sen. David Zuckerman's (P/D-Chittenden) decision to leave the legislature to run for lieutenant governor has kicked off a race for the state's most populous Senate district. Four of his five seatmates — Democrat/Progressive Tim Ashe and Democrats Phil Baruth, Ginny Lyons and Michael Sirotkin — say they're planning to run for reelection. The fifth, Republican Diane Snelling, says it's "probably too early to say." Meanwhile, three challengers have already stepped up to the plate. Burlington lawyer David Scherr, a former chair of the city and county Democratic parties, announced last November. Williston Selectboard member Debbie Ingram, who runs Vermont Interfaith Action, did so last week. And Winooski lawyer Faisal Gill says he's definitely running and plans to make a formal announcement soon. Others, including Burlington consultant Dawn Ellis and Rep. Chris Pearson (P-Burlington), are eyeing the empty seat. "They're all incredibly smart, capable people, so I don't have any doubt that, when it gets whittled down to six, we'll have six real contenders," says Baruth, who, as majority leader, is in charge of Senate Democrats' electoral efforts. Each of the candidates has strengths: Scherr got an early start and locked up some establishment Democratic support. Ingram and Ellis have both won the Democratic nomination before — Ingram in 2012, and Ellis in 2014 — though both fell short in the general election. Gill has perhaps the most unusual pedigree of the lot. He served in senior positions in Bush's Department of Homeland Security and ran for the Virginia House of Delegates in 2007 as a Republican. Nearly two years ago, documents obtained by National Security Agency contractor Edward Snowden showed that Gill was one of at least five prominent Muslim Americans whose emails had been monitored by the NSA. Since moving to Vermont three years ago, Gill has become a prominent Democratic donor. He attributes his party switch to the discrimination he faced running for office in Virginia. "The experience I had was just so negative that it was beyond clear that Muslims are just not welcome in the Republican Party," he says. Pearson, a five-term state rep and leader of the House Progressive Caucus, is probably the best known of the bunch. He says he would like to have "a bigger platform to stand up for the things I believe in" but worries about leaving a relatively safe seat for an uncertain race. "People are talking to me about it a lot, and there's a lot to consider," he says. If Pearson runs for Senate, his Old North End House district — a perennial battleground between Dems and Progs — would have two vacancies, because his seatmate, Rep. Kesha Ram (D-Burlington), is running for LG. Progressive Burlington city councilors Selene Colburn and Max Tracy are both interested. "I think I'm going to run for it," Colburn says. "I'm pretty sure!" The original print version of this article was headlined "Trumped Up"